The quality of your Broadband Internet access is critical if you wish to use it for your business phone calls and take advantage of cheap VoIP rates, plus other call handling features. Download and upload speeds (when you make calls, it is important that you have a good upload speed because that affects the quality of the voice data you send out). Quality of your modem (should have the ability to optimise for Voice data… called QoS – Quality of Service). This means that if there is a lot of voice and data traffic on your network, the voice traffic will be given priority. No tapering or shaping. Normally when you reach your download limit the speed of your connection is slowed down considerably. This is not ideal for voice communication because it renders the connection useless. Use a service that does not taper (but charges for excess usage) or a service that emails you with notification that you are close to your monthly quota (like iiNet). Use a Business grade plan because it is expected that you need the service up and running (with no downtime) most of the time. If this is critical see if your ISP has an SLA (Service Level Agreement). Ensure that your Business grade Broadband has been prioritised for Voice. If you have more than 6 extensions we recommend a dedicated VoIP ADSL service for your voice traffic. Please Request a Quote for ADSL pricing. The term ‘line’ is usually associated with a copper wire coming into your office. This line normally comes with the functionality to allow you to make voice calls and each one comes with its own “telephone number”. With a VoIP Telephone system PBX the meaning is different. Every subscription comes with a Direct Indial Number (called a DID). You can choose whether to make these numbers known to your customers (have them call you directly, bypassing Reception), or have every call go through reception before they get to you. A great feature of VoIP business grade telephone systems is that each Subscription with voicemail can have the voicemail messages emailed to the user of that extension. IP stands for Internet Protocol and the great feature about IP Phones and business grade VoIP telephone systems is that each handset is smart and doesn’t require connection to a PBX unit in your office. Each device is configured to work with the CloudPBX system so you can actually take the phone home if you wish.You can take your phone with you when you travel and act as if you are in your home town (this includes low VoIP call charges). 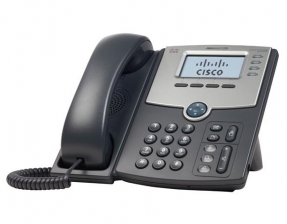 We recommend industry leading Cisco and Yealink IP phones. Some fundamental questions that need to be answered when a new IP handset is configured includes the DID (direct Indial Number) and Internal extension, which employee the phone is allocated to and their email address. Do you want the DID to be visible to people your staff call? Would you prefer to have your main indial number show when staff call out? Do you want a different voicemail service for every employee or one central one? The Setup cost for each handset includes it being configured for your CloudPBX, delivery to your office and remote support for your IT person when the phone arrives in your office. What happens when your main incoming phone number is called? Do you want the reception phone to ring and then forward to another handset after 10 seconds? If that’s not answered, would you like the call to go to voicemail? If the reception phone isn’t answered in X seconds, where should it be routed to? Would you like a different call group for accounts, sales, support etc? If all your staff are busy would you like a Call Queue with periodic announcements? Would you like to be able to Page the warehouse from the office? Once phone numbers are allocated, users assigned and created in the cloud, then the handsets can be configured to connect to the CloudPBX utilising call handling features like IVR/Auto Attendant, Call Queues, Call Groups, Voicemail-to-Email. Your CloudPBX consultant will communicate with you to understand your call flow configuration and service feature requirements and then work with our technical team to ensure your service is setup and running as you would like it. This can includes modifications to the system after initial deployment. CloudPBX Hosted PBX services use the highest business grade vodecs and whitelist international carriers to ensure that along with cheap call rates, your business has the highest voice quality. These rates are approximately half of Telstra’s normal retail call rates which represent a huge saving. Prices do not include GST and are available on the Stratus Call Plan with Direct Debit authority. What about my Telstra number? Using your Telstra number is easy. Call diversion immediate can be setup on your Telstra phone number to your main Direct InDial (DID) number. This means that everyone who calls your normal number will be answered on your new IP phones. There is a cost for the diversion for each incoming call, but this is only temporary before we transfer your Telstra number to CloudPBX and you start paying half price for it. Transferring a number to your CloudPBX Hosted PBX service is called “Porting” and its a process that can take 1-2 weeks to complete, but once its complete you will no longer be paying high monthly rates through Telstra for your phone service. Request a Quote and we’ll explain everything there is to know about potential outages and how we can ensure the best quality continuous VoIP telephone service. We can work with your existing IT Support Consultants or remotely support your server and devices. Let us know what you need help with and we can include it in your quotation. There are some amazing and powerful features that you can configure yourself or get support for us to help you. Doing it yourself (with help when you need it), means your own staff can configure services and features as your business grows and changes. We provided written instructions on how to configure the most popular IP telephone handset brands in your Service Dashboard, but if you want to use specific hardware brands make sure you let us know when you request a quote.